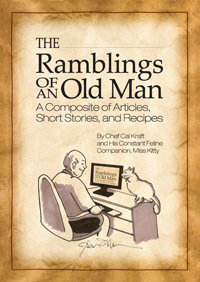 Chef Cal Kraft and His Constant Feline Companion, Miss Kitty’s “The Ramblings of an Old Man.” Chef Cal, a well-known personal chef and culinary instructor, initiated what became a hugely popular monthly column, “The Chef’s Corner,” for a community newsletter. In it, he shared tales about his family, his life growing up in the suburbs of New York, events within the community, recipes and, of course, Miss Kitty’s opinions. In this book, you too can re-create the memories and those foods from Chef Cal’s newsletter column.